I don't just drink wine, I savor the label and brighten at the writer who deftly combines taste and wit with a splash of verve. 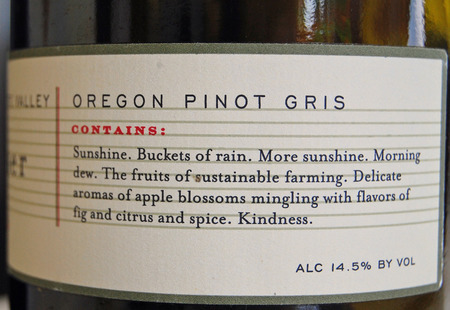 This label is from Sokol Blosser, my favorite Oregon winery (this pinot gris is available at the winery, and at The Wine Place in Yachats, Oregon). For another wonderfully poetic label, see Wine Words (a nod to my other favorite Oregon winery, King Estate, and their "next" label). Surely, literary labels aren't limited to Oregon. What's your favorite find? Older PostThankful Thursday: Once More?